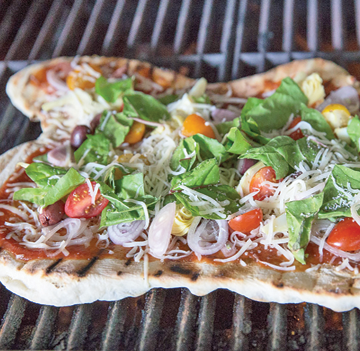 We get it: It’s summer, and who wants to heat up the oven to cook a pizza? But why would you when you have the perfect pizza oven in your backyard? That’s right, your barbecue grill. Grilling pizza keeps you outside where the action is and results in a crispy crust similar to what you get in a wood-fired oven. First, arrange all the ingredients below including pizza dough, sauce and toppings. Set the toppings in small bowls on a tray placed near the grill. A pizza peel helps slide the pizza on and off the grill easily. 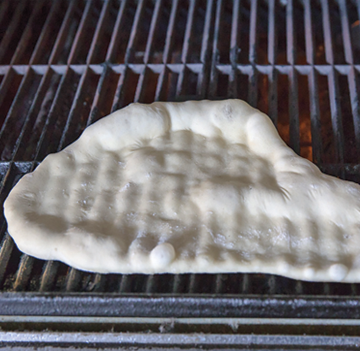 Once the dough hits the grill, things move pretty fast. The grill needs to be spotlessly clean and hot to produce a charred and crunchy crust. Eight ounces of dough yields about an 8- or 9-inch round pizza. Store-bought pizza dough can be used or prepare it from scratch. Combine warm water, sugar and yeast in a small bowl and whisk to combine. In the bowl of stand mixer outfitted with a dough hook, combine flour, salt, olive oil and yeast mixture. Mix for 5 minutes until the dough is smooth and elastic and comes away from the sides of the bowl. Place dough in an oiled bowl turning once to coat both sides of the dough with oil. Turn grill on high and pre-heat for 15 minutes. Clean grill thoroughly with a grill brush. Lower heat to medium-high (aiming for about 425 degrees). Pour a little olive oil onto a paper towel and using a long pair of tongs carefully wipe paper towel on grill grates to help prevent the dough from sticking. Roll out dough on a floured pizza peel or baking sheet into a circle or oval. If dough doesn’t roll easily, let rest for 10 minutes and then try again. 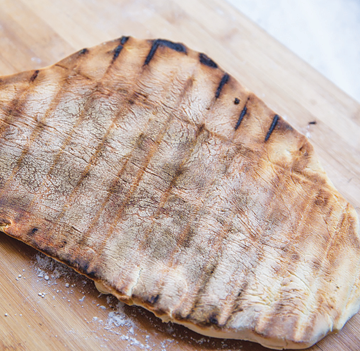 Slide the dough from the peel or baking sheet on the grill. Close the grill lid and let cook for 2-3 minutes. When the crust starts to bubble around the edges and has grill marks on the bottom remove pizza dough from grill back onto pizza peel or baking sheet. Spread a thin layer of sauce, toppings, and cheese on the grilled side of the pizza and return to grill the other side of the dough. Cover and cook through until the pizza dough has grill marks on both sides and the cheese is melted. Remove from grill and let rest a few minutes before slicing. Clean and oil grill before grilling any additional pizzas. 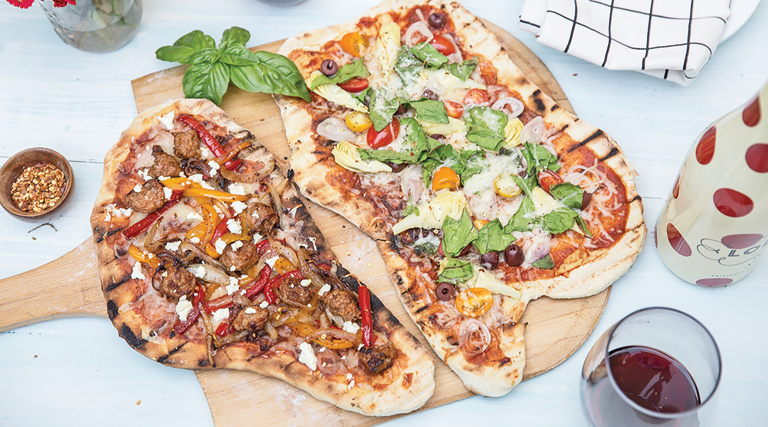 The pizzas cook very quickly, so it’s easy to keep them coming off the grill to feed hungry guests.